To curb speculation, the National Commodity and Derivatives Exchange (NCDEX) last week imposed an additional special margin on chana. The margin is effective Tuesday. For all chana contracts, the exchange levied an additional margin of five per cent (in cash) on both buying and selling, as well as a special margin of 10 per cent (in cash) on buying. Following this, the overall cash margin on buying is 25 per cent, while that for selling is five per cent. On Monday, chana contracts declined four per cent and hit the lower circuit on the NCDEX. October chana contracts were down 3.99 per cent to Rs 4,374/100 kg. The sentiment was dull in physical markets, too, with demand declining, said traders. "We have witnessed a fall of Rs 550/100 kg, or about 10 per cent, in spot markets in the past week and the demand is still not encouraging," said P Agrawal, a chana broker here. Of late, chana prices in the spot and futures market have seen excessive short-term volatility. During July 1-September 3, spot prices increased 13 per cent, while the futures prices for the September and October contracts increased nine per cent. The December contract rose five per cent, said an NCDEX note. 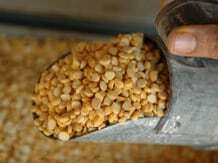 In the beginning of August, chana prices stood at Rs 4,500/100 kg, before exceeding Rs 5,000/100 kg in the beginning of September, traders said. But after NCDEX took various regulatory steps, the prices started declining last week. Meanwhile, NCDEX has clarified the final expiry date for chana will be seven months.